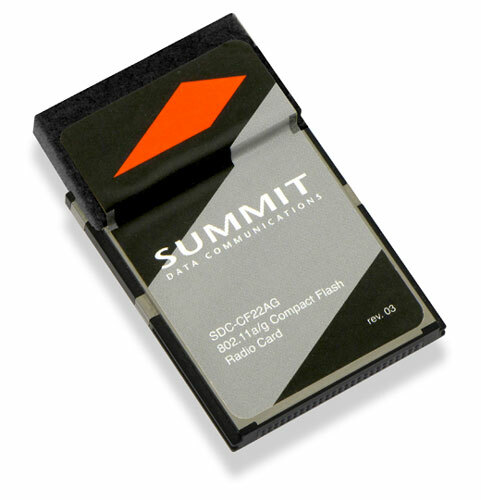 The SDC-CF22AG card provides all key Summit brand hardware and software capabilities in a compact flash card (CF) form factor. This dual-band radio card operates in both the 2.4 GHz and 5 GHz frequency bands, supporting IEEE 802.11a (5 GHz) as well as 802.11b and 802.11g (2.4 GHz). The SDC-CF22AG card is ideal for use in any business-critical mobile device with an external CF slot. ETSI:13 (3 non-overlapping). FCC and KC:11 (3 non-overlapping). MIC:14 (4 non-overlapping). ETSI: 19 non-overlapping. FCC and KC: 23 non-overlapping. MIC: 8 non-overlapping.